Bachelor are great fun, but complicated when it comes to money. You have to remember who bought the fancy accessories for the bride or groom to be? Who paid for the last drinks at the hotel? Who paid the B&B host for next morning’s breakfast? You are commited to throw the perfect bachelor(ette) party for your best friend. Yet it is always impossible keep track of all the expenses… When the time comes to split costs, drama won’t is set to appear. Thanks to Tricount, you never have to worry again. Create accounts, share them with your friends, and let everyone add his or her expenses. 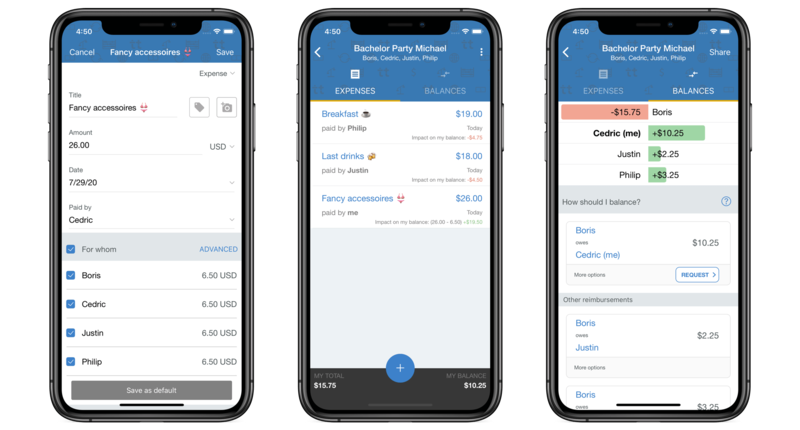 The app will tell you how much everyone spent, how much everyone owes and enables you to pay back your friends in a few clicks. You can now focus on the important things, and celebrate your best friend's last moments before embarking into marriage. Paintballing and bungee jumping during a weekend in the countryside? Let Tricount organise your group expenses, and make of this bachelor(ette) party an unforgettable memory!